You are looking for something special for your bathroom, a built-in bathtub that is not comparable to all other bathtubs? How about a new asymmetric Duravit Paiova bath? 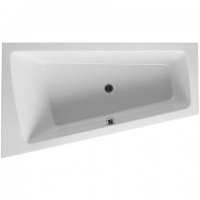 This bath is also available as Duravit Paiova Duo bath for the bath for two. Now there is only missing a Duravit Paiova bath pillow for everybody and then you have the perfect Home Spa experience. Simply everything with Duravit Paiova baths is right, internally and externally. The asymmetric Duravit Paiova bathtub can also be provided with an elegant real wood cladding, so that your Duravit Paiova bath will become an eye-catcher in the bathroom.